Sacred sites are conveners of indigenous science. The architecture of these spaces embodies teachings and demonstrates indigenous science insights and wisdom. To begin preliminary research for organizational collaboration in jaguar conservation in Mexico, WISN travelled to Oaxaca to meet with Mixteca cultural practitioner, artist and musician, Ernesto Olmos. 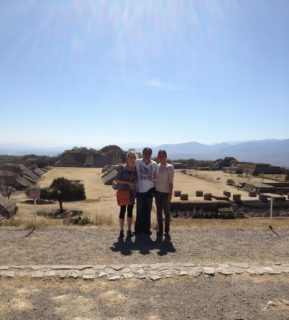 Olmos invited WISN team members Beth Duncan and Chyna Colorado to the Monte Alban pyramids. Following a ceremony asking for permission to enter the sacred site, Olmos led Duncan and Colorado through the pyramids pointing out jaguar symbolism throughout the architecture explaining the significance and sacredness of the jaguar to indigenous people. From this grounding point, the team was then able to continue their research, meeting with local artists, scientists and scholars to determine the next phases of WISN’s collaborative efforts to help protect jaguars.